It’s impossible to disprove the existence of invisible agents. In this case, the agent is a theoretical weapon wielded by unidentified assailants that leaves no trace. 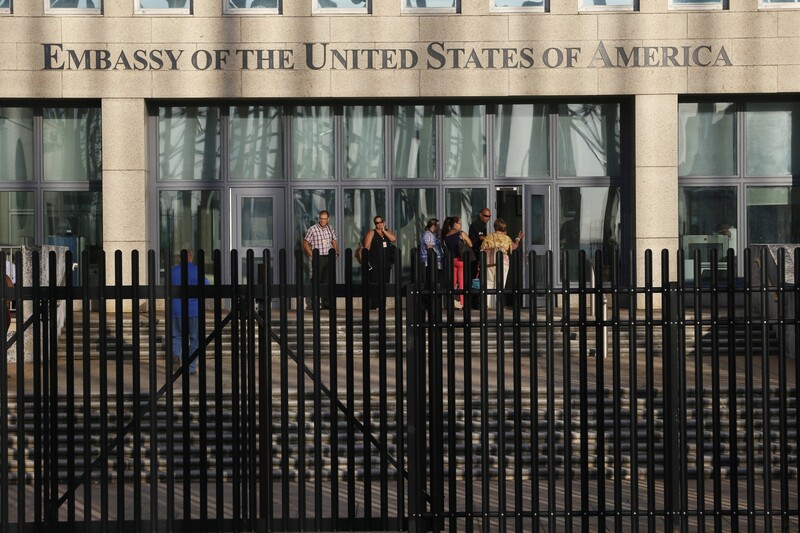 A series of attacks with a microwave weapon is the latest theory for what could have sickened or distressed roughly two dozen people associated with the U.S. Embassy in Cuba over the past two years. This hypothesis, advanced in recent days in several news reports, dominated a House Foreign Affairs subcommittee hearing on Cuba policy Thursday afternoon. But a panel of State Department officials said there is still no explanation for the reported injuries. “We’re seeing a unique syndrome. I can’t even call it a syndrome. It’s a unique constellation of symptoms and findings, but with no obvious cause,” testified Charles Rosenfarb, the State Department’s medical director. Despite the buzz over microwaves, experts warn that caution is in order. There’s an old scientific aphorism that extraordinary claims require extraordinary evidence. “And they’re not giving the extraordinary evidence. They’re not giving any evidence,” said physicist Peter Zimmerman, an arms control expert and former scientific adviser to the State Department and Senate Foreign Relations Committee. No microwave weapon that affects the brain is known to exist. The FBI has investigated the Cuba cases and found no evidence of a plot. Searches of the U.S. Embassy and other locations in Havana have turned up no sign of a weapon. Most significantly, doctors examining the sickened diplomats have established no clear link between their symptoms and any external source. The only major medical examination of the sickened diplomats, published in the Journal of the American Medical Association in February, found that they “appeared to have sustained injury to widespread brain networks without an associated history of head trauma,” and suggested that they could be victims of a novel agent. The New York Times reported Saturday that Douglas H. Smith, a University of Pennsylvania doctor who was senior author on the JAMA report, considers microwaves a main suspect in the Cuba case. Smith told the Times that he and his colleagues are increasingly certain that the patients have brain damage. Smith did not respond to requests from The Washington Post for an interview, and Penn did not provide evidence for the claims or make available other doctors involved in the assessments of the diplomatic personnel. Skeptics of the microwave weapon hypothesis face their own challenge: It’s impossible to disprove the existence of invisible agents. In this case, the agent is a theoretical weapon wielded by unidentified assailants that leaves no trace. Critics say this just doesn’t pass a plausibility test. “It’s crazy,” said Kenneth R. Foster, a professor of bioengineering at the University of Pennsylvania who studied microwave phenomena while working at the Naval Medical Research Center in Bethesda. Foster, who was not involved in examining the diplomatic personnel, said that the reported illnesses remain mysterious and that he doesn’t have an explanation. “But it’s sure as heck not microwaves,” he added. Critics say that Smith and his colleagues have sought an exotic explanation for a relatively common occurrence. Cases in which a number of patients report physical symptoms with no detectable cause, they say, can have a variety of non-external origins, including psychological factors such as stress, and can spread contagiously. In such a scenario, the symptoms are real. The suffering must be taken seriously. But no microwave weapons are necessary. At last count, 26 people associated with the U.S. Embassy in Cuba reported medical symptoms consistent with mild traumatic brain injury, according to the State Department. The first few cases arose in late 2016. The people typically reported hearing strange noises, including chirping or buzzing sounds. They then suffered from symptoms such as headaches, dizziness, insomnia and ringing in the ears. These incidents did not happen in a single location but rather in multiple places in Havana, including U.S. government-provided homes and hotel rooms. At a large gathering of embassy personnel in March 2017, officials warned that there had been a rash of attacks — and soon thereafter the reports of attacks spiked, according to an investigation published this year by ProPublica. The incidents of reported attacks later spread to Canadian diplomats in Cuba and their families, and eventually to State Department employees in China. This week, the department said a single employee in China has suffered symptoms consistent with mild traumatic brain injury. A panel of experts appointed by the Cuban government to investigate the issue last year concluded that the U.S. diplomats most likely suffered a “collective psychogenic disorder” brought on by stress. “If your government comes and tells you, ‘You’re under attack. We have to rapidly get you out of there,’ and some people start feeling sick . . . there’s a possibility of psychological contagion,” said Mitchell Valdés-Sosa, director of the Cuban Neurosciences Center and a member of the panel. He and his colleagues plan to publish the full results of their research in the coming days. They will make their data publicly available, Valdés-Sosa said, and they have reached out to counterparts at the National Academy of Sciences in the United States to suggest a joint investigation. The JAMA report published in February acknowledged that there was no hard evidence that the patients were attacked. The doctors found no physical brain damage they could link to any events in Cuba. The report does not mention microwaves. JAMA this summer published four letters from a total of 10 doctors and scientists criticizing the original study, with some arguing that the Penn team incorrectly ruled out the possibility of psychological factors. Others criticized the criteria the doctors used to define impairment as overly broad. Beatrice Golomb, a professor of medicine at the University of California at San Diego, is a leading proponent of the theory that pulsed microwaves could explain the symptoms. She said a friend sent her theory of the case to the State Department in January. She has authored a paper that will be published in coming days in the journal Neural Computation, she said. The symptoms experienced by the Cuba patients match symptoms in other people who are “electrosensitive,” according to her analysis, which relies on the JAMA study and news reports. Golomb said she had not seen or communicated with any of the patients or with the doctors who evaluated them. Proponents of the microwave theory cite studies investigating a possible link between cellphones and cancer. Cellphones emit radiation from the radio part of the electromagnetic spectrum, which includes microwaves. But decades of research have not established that low levels of radio frequency radiation can harm human health. The American Cancer Society and Centers for Disease Control and Prevention say there is no scientific evidence that links cellphones to cancer, although both call for more research on the issue. The World Health Organization classifies radio frequency radiation as a “Class 2B carcinogen,” meaning it possibly can cause cancer in humans. And it’s not clear how a hypothetical microwave weapon would work. Allan Frey, a retired neuroscientist, reported evidence in the 1960s that microwaves can cause a person to perceive sounds under certain circumstances. That could in theory explain why some of the people who experienced “attacks” heard unusual noises. But Frey acknowledged that the biology behind this phenomenon is still unknown and said he believes whatever happened in Cuba will remain a mystery. Radio waves and microwaves are much lower in frequency than the kinds of radiation known to cause tissue damage, such as ultraviolet and X-rays. Microwaves are non-ionizing — they don’t carry enough energy to remove electrons from atoms, which can damage DNA. Microwaves are absorbed by the skin and can cause tissue damage through heating at high intensities — this is why it would be a bad idea for you to stick your head inside a microwave oven while it’s on. Experiments in water, cats and rodents have found some evidence that small sound waves may be produced by microwaves heating water in brain tissue. “But those effects are basically trivial,” said Foster, the engineer who studied microwaves. To create a sound wave severe enough to be painful, researchers suggest, would take millions of watts of energy and cook a victim’s brain tissue before the sound ever bothered them. Foster said there is no technology capable of using microwaves to produce the kinds of symptoms that the U.S. diplomats have experienced — and not for lack of trying. During the Cold War, after discovering that the U.S. Embassy in Moscow was being bombarded with low-level microwaves (probably for surveillance purposes), the Pentagon spent several years researching the consequences of microwave exposure and uncovered no evidence of physical or psychological effects. More recently, various branches of the military have sought to create microwave tools that disable opponents by interfering with their hearing or other brain systems, but none appear to have been fully developed. Originally published at www.washingtonpost.com on September 6, 2018. Dominio Cuba informa, investiga, contextualiza, usa tus códigos visuales y te divierte.